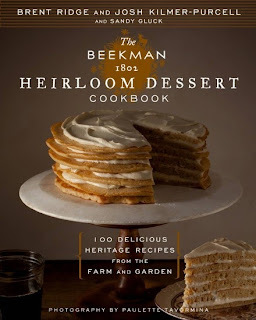 Way back in 2010, long before the Amazing Race, long before any cookbooks, and the afternoon before their first appearance on television, Lucindaville was begging everyone to watch the Fabulous Beekman Boys. We just knew they were going to be stars. A mere three years later after a marriage, $1,000,000, a mercantile, two television seasons, and a lot of cheese; they have not one but two cookbooks. Whod'a thunk it! So here we are three years later and EVERYONE is writing about the Beekman Boys. Seriously they are in more magazines than Kate Moss. So we are going to keep it short and sweet, like The Beekman 1802 Heirloom Dessert Cookbook. 1. The book is beautiful. 2. The photo are beautiful. 4. they seem very modern (much like the boys themselves). 5. It's dessert! Buy a copy. In a large, heavy-bottomed saucepan, combine 1 1/2 cups of the milk, the cream, honey, orange zest, cardamom, and salt and bring to a simmer. In a small bowl, whisk the cornstarch into the remaining 1/2 cup of milk. Add to the simmering cream mixture and cook, stirring constantly, for 1 minute, or until thickened. Let cool to room temperature. Transfer mixture to an ice cream machine and process according to the manufacturer's directions. Serve right away or transfer to a freezer container and freeze. If you like, serve with a drizzle of honey. Now, guess who is going to be on the cover of Popular Mechanics? This one looks really interesting. I think I am going to have to create a new "to read" list, just for cookbooks! Recipes come directly from the listed cookbooks. We impose no uniform standards upon them. That is why you find omelettes and omelets, cups and liters and other peculiarities in the text. And I'm a bit dyslexic, so my personal spelling can be a tad idiosyncratic on its own.